This week CSA members are getting cucumbers, summer squash, green onions, kohlrabi, green tomatoes, and for our full shares kale and the swiss chard that we had hoped to harvest 8 weeks ago before the deer munched it down! 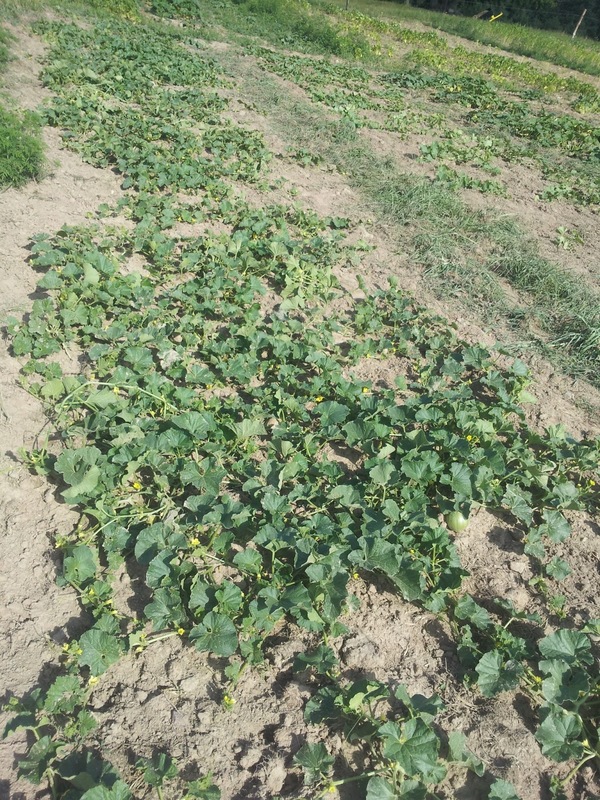 Full shares also get to try the first of our Lemon cucumbers, one of Farmer Figgins' favorite heirloom varieties. We've had a wet and cold week, and while we never begrudge rain, the cold has slowed our tomatoes ripening. So this week we thought we'd unburden some of the laden plants and share a southern favorite: green tomatoes! We'll be sharing our own fried green tomato recipe later this week, but check our these green tomato recipes and get a taste of this southern favorite! Enjoy the slight melon-like taste of cucumbers in any sandwich. Cucumbers go well with dill, fish, and egg dishes. Try an Egg and Cucumber sandwich, or an old british tea party favorite Cucumber sandwiches. For these sandwiches, the spread can be yogurt, mayonnaise, butter, or cream cheese, try it with a sprig of dill or mint. Perfect for a hot day! Our full shares also get to enjoy the first of our lemon cucumbers, bite into these raw with a little salt, a delicious snack! us to enjoy! 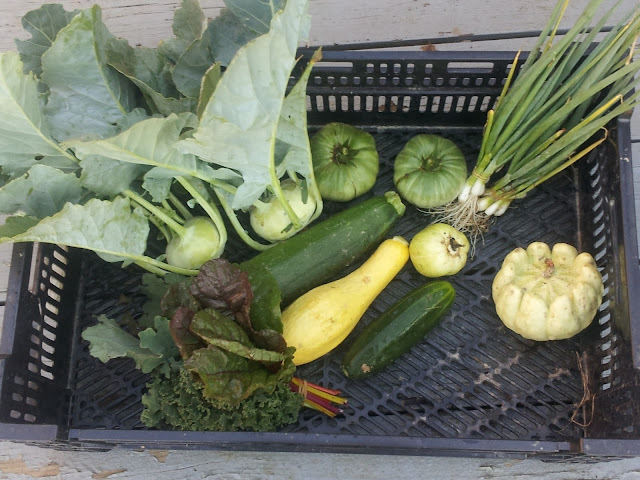 These beauties are growing well and fast, so a few got away from us and reached zucchini bread size. If you receive a large zucchini in your share, don't despair! These mammoths are great for stuffed squash or for making delicious zucchini bread. 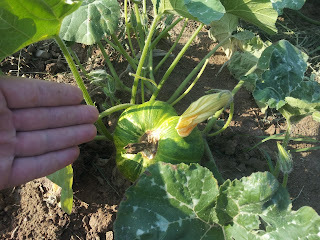 Farmer Figgins always uses large zucchini for zucchini bread, shredding up the zucchini and storing the extra in the freezer for bread later in the year. For an extra unhealthy treat, try some cream cheese icing on the zucchini bread! Kohlrabi may be a new vegetable for some of you, but we promise it's one you'll be glad to try! 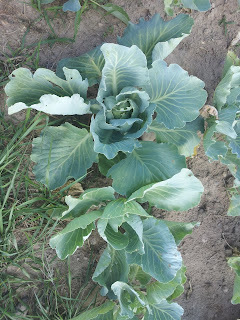 The word Kohlrabi is German for cabbage turnip, and it can be eaten raw or cooked. 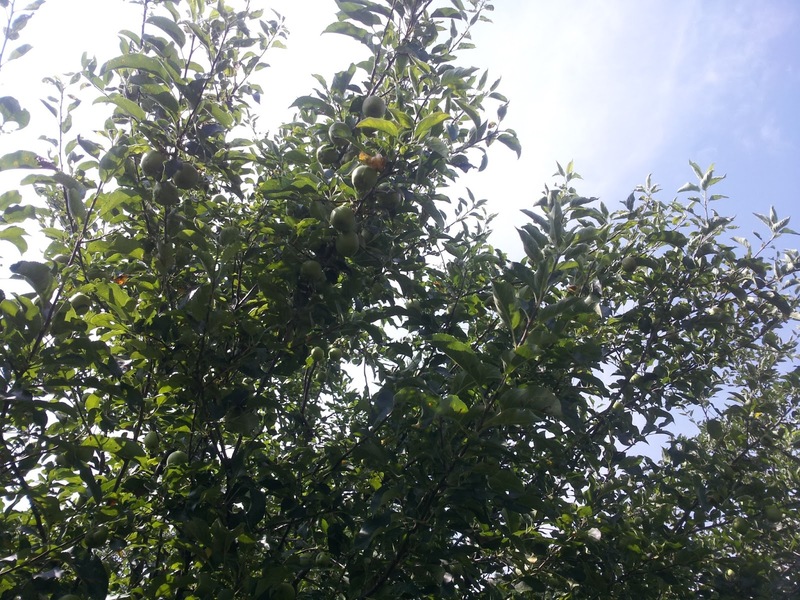 We usually eat them raw, just peel off the skin and slice them like an apple and sprinkle with a little salt and enjoy! They're also great raw on a salad, or roasted, or baked. Popular in Indian food, in dishes like Kohlrabi Curry. This week our full shares get to enjoy kale and the first harvest of our swiss chard. Swiss chard is another extremely healthy green that helps regulate blood sugar and a great source of anti-oxidants. Try the swiss chard as a side dish, with this easy Savory Swiss Chard recipe. 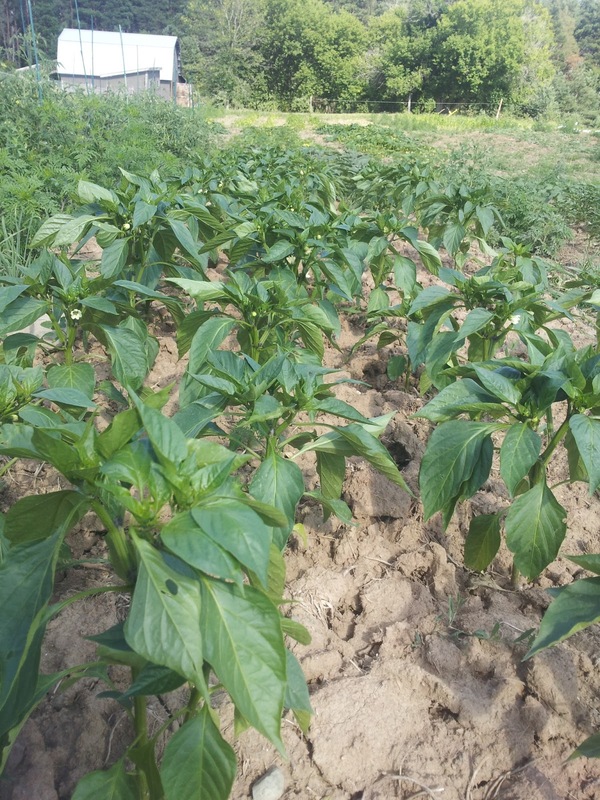 Since our last update in June, we've sweltered through the week long heatwave and caught up on weeding the garden. 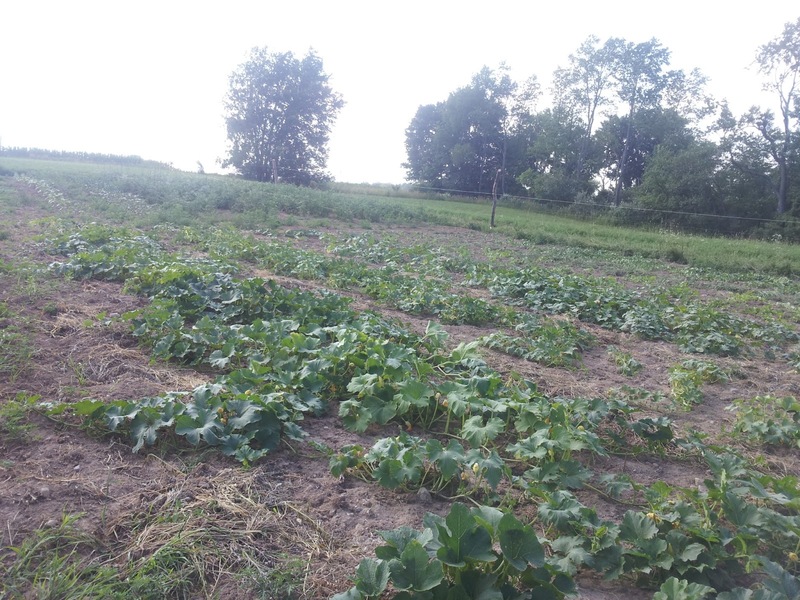 Next to save the pumpkin patch! We thought we'd share some of the garden's summer splendor. so that and the heatwave has slowed them up a bit. 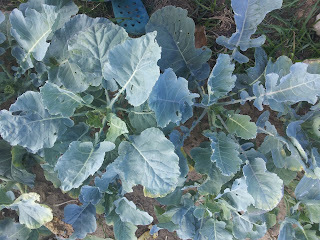 One of our Broccoli varieties did not care for the heat. that we're looking forward to, is just starting to head and didn't bolt! 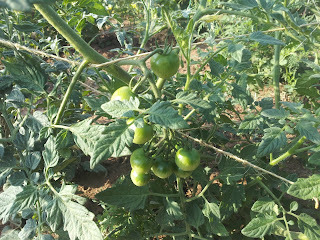 We saw the first tomatoes, the Velvet Red cherry variety, starting to turn red! 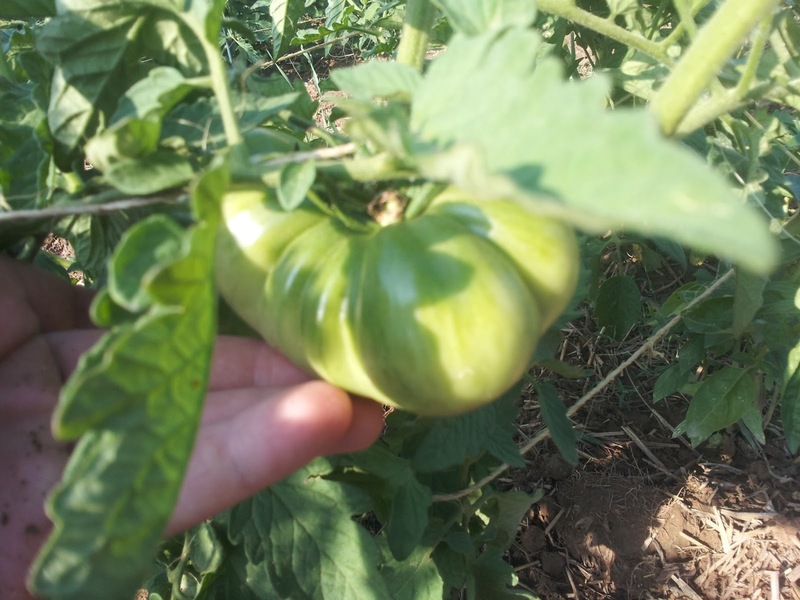 The Sheboygan Tomatoes are getting huge! Any else like Fried Green Tomatoes? 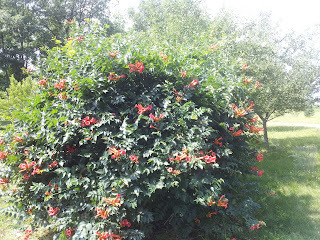 and will start to form flowers soon. 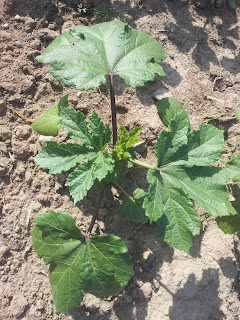 We were tempted by some Okra seeds, and seeded some this spring. And now they're about to flower! One of the Musque de Provance, or Cinderella pumkpin. 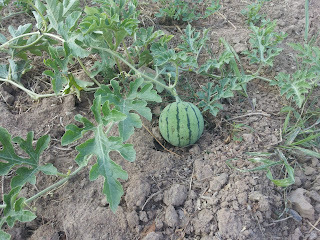 Melons are coming along great, with some small fruit and some large already set and growing. Green Beans, Summer Squash, and Cucumbers. Our Summer Squash have been hit with a Squash Vine Borer infestation, we did a little plant surgery on them to excise the buggers, and are hoping they'll pull through! 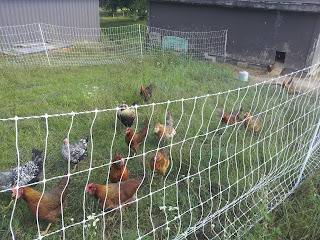 Our laying hens are loving the recent rain and fresh pasture. has taken special interest in one of the females...And we've thought about keeping a breeding pair. Any name suggestions for his special lady? with Hodor in the lead at 150. 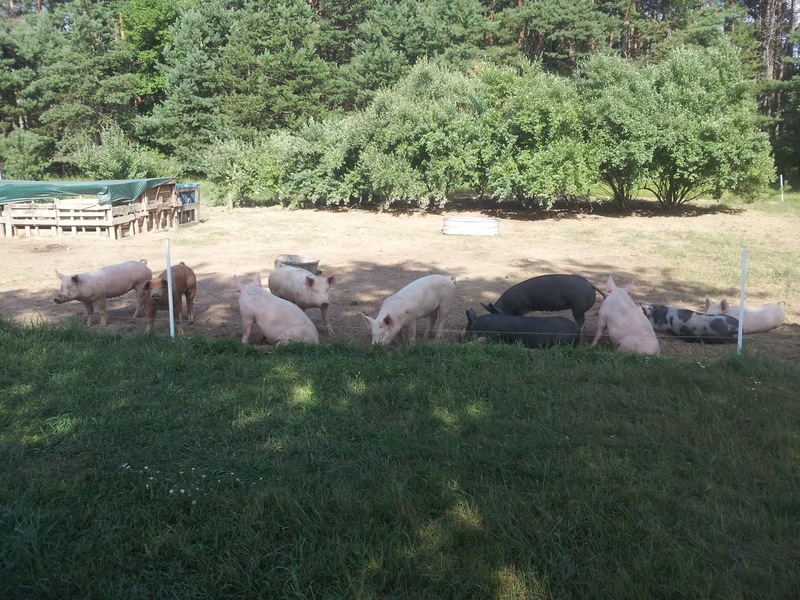 They spent the heatwave sprawled in their wallows, covered in water and mud. 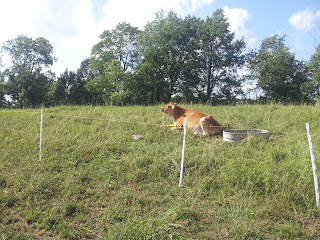 We've moved Rosie back on top of the hill, next to the pigs and laying hens. 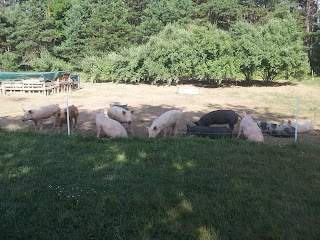 She seems much happier so close to the pigs. We'll be artificially inseminating her in August, for a calf in May! 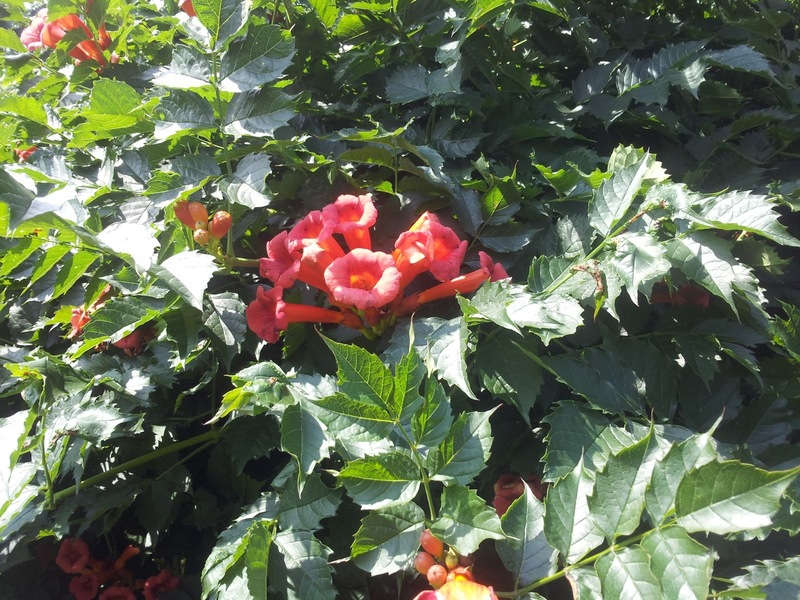 We've got several trumpet vines that are taking over! 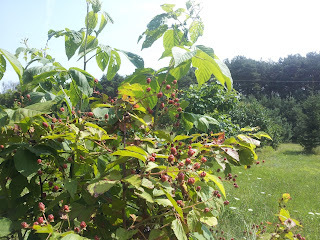 Berries! Sorry shareholders, these are only going make it as far as my pie! It is coming to the end of the 8 week stretch where we've been raising 80 chickens from chicks to dinner table size, about 5 pounds. We will be processing the birds on August 4th and pick up will be that evening at 6 pm. 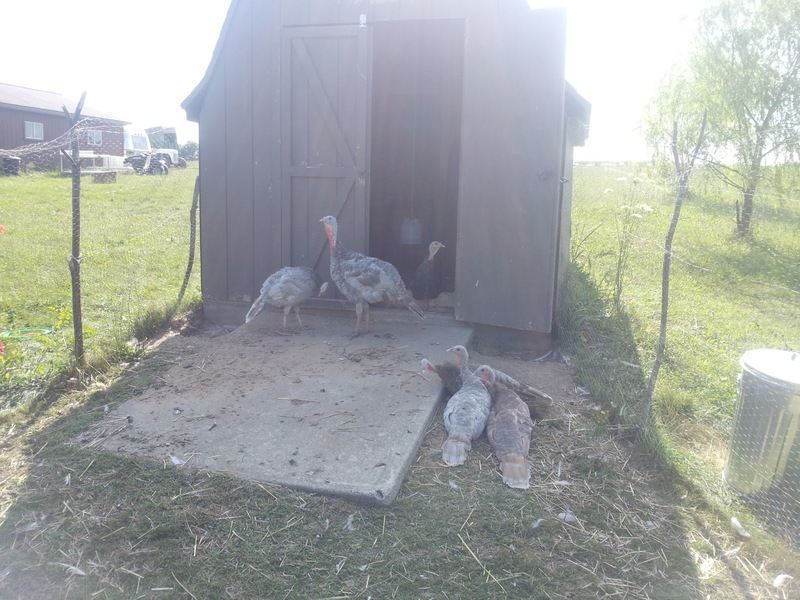 We still have about half the birds available for pre-order and they will cost $15 per chicken. These chickens are very good size I expect them to average 5 pounds, meaning that your chicken will likely be less than $3.00 per pound. You can barely buy chicken for this at the grocery store certainly not organic, and certainly not pasture raised. We will only be doing one run this year, so make sure when you are ordering, you order for more than one meal. There will not be a second chance to get this high quality chicken until next year. So that you can store the birds all winter and for up to a year or longer, we will be offering to vacuum seal your chickens for an extra $1 to cover bag costs. Otherwise they will be in a lower quality bag and can still be frozen, but will not have as long a life expectancy in the freezer, about 6 months. less fat than a conventionally farmed chicken! If you have never experienced a whole roasted chicken, then you are in for a treat. There is a reason this was the go-to Sunday dinner for Americans for generations. It was common to have the whole family over for a Thanksgiving-like meal and the center piece was a roast chicken. Nowadays, we reserve such an occasion for the holidays and associate the large amount of work of preparing a roast turkey. Roast chicken is far easier and faster. It can be done on the grill, or in the oven. We have a great recipe on the blog for roast chicken in the oven, and will be adding another entry for Beer Can chicken which is done on the grill. Either way, the result is a very high quality meal that can feed the whole family. We recently did a chicken for Farmer Figgins' birthday, and we fed 4 people with leftovers, and of course still had a meaty carcass for making stock for soup. Between the two of us, we usually have enough for several meals out of one chicken: breast for dinner, drumsticks for another dinner, tenderloins with salad or on a sandwich for lunch, and 4 wings for another lunch, and stock for usually 4 servings of soup. Get the most out of your meat by making stock! If doing a whole chicken at once doesn't make sense for you, or you aren't looking to invest as much time into dinner as a roast chicken requires, it is very easy to get all the individual cuts off a chicken. 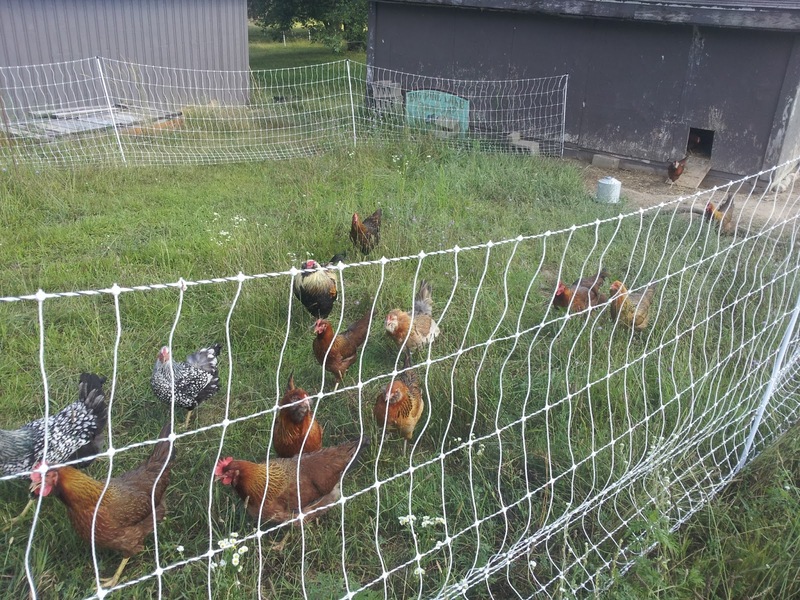 Our friends at Chicken Thistle Farm have put together a great video of how to get the parts off your pasture raised bird. 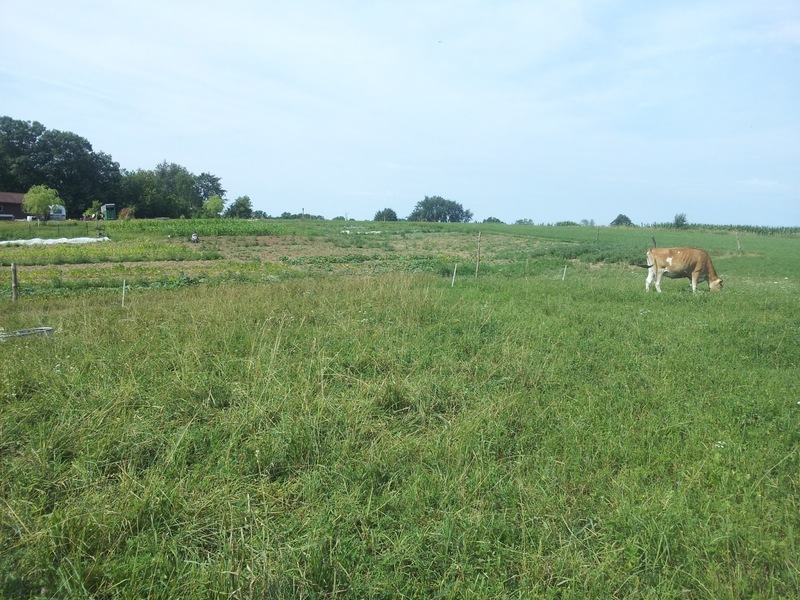 So hurry up and put in your order for our limited supply of Pasture-Raised Chicken! Email us at ShireFarmMI@gmail.com with your interest and we will reserve your birds! Find out more on our Pasture-Raised Chicken page. 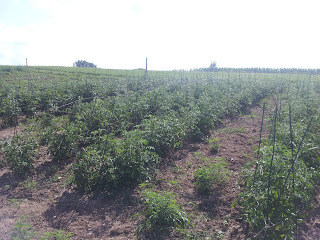 A Preview of Tomatoes to Come! We're eagerly anticipating the first of our tomatoes, hopefully at the end of this month or the beginning of August. We've got several varieties this year, both heirloom and hybrid, that we're excited to try. 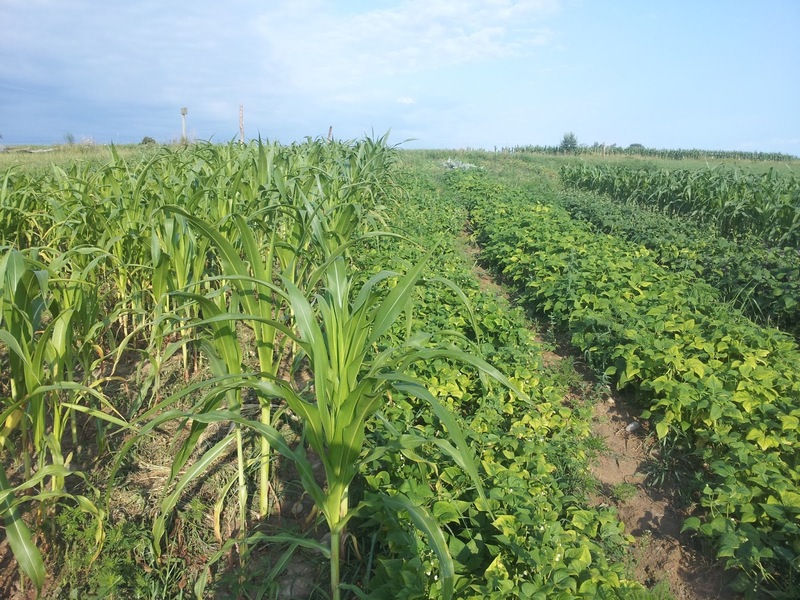 Being new to the region, we decided to try a few varieties that were developed in the Great Lakes region and do better in this climate. Kellogg's Breakfast-West Virginia heirloom obtained from Darrell Kellogg of Redford, Michigan. Large orange beefsteak fruits weigh 1-2 pounds. Delicious rich flavor with a good acid/sugar balance. Aunt Ruby's German Green-Family heirloom from Ruby Arnold of Greeneville, Tennessee. Large beefsteak fruits weigh one pound or more. Sweet juicy flesh with a hint of spiciness. 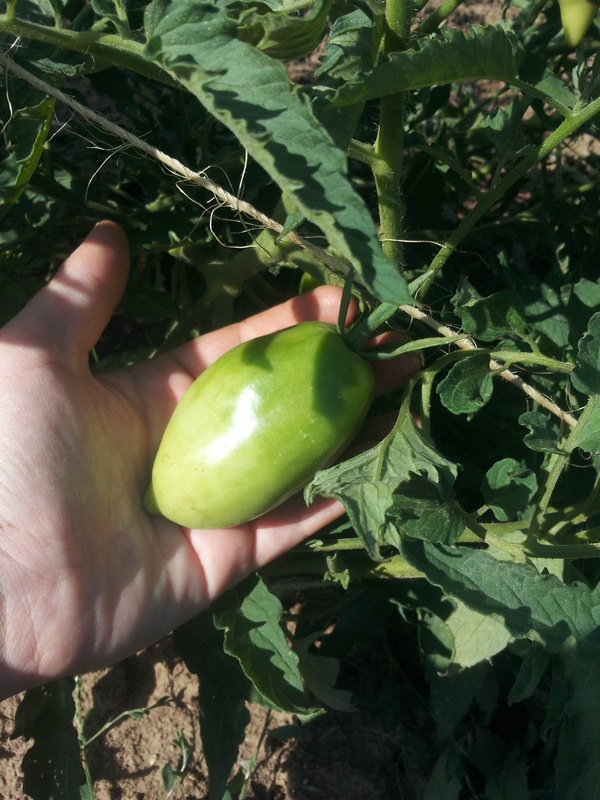 The flavor of Aunt Ruby's is legendary and award winning, sweet and tart like other green tomatoes, but also has a rich spiciness that others are lacking. 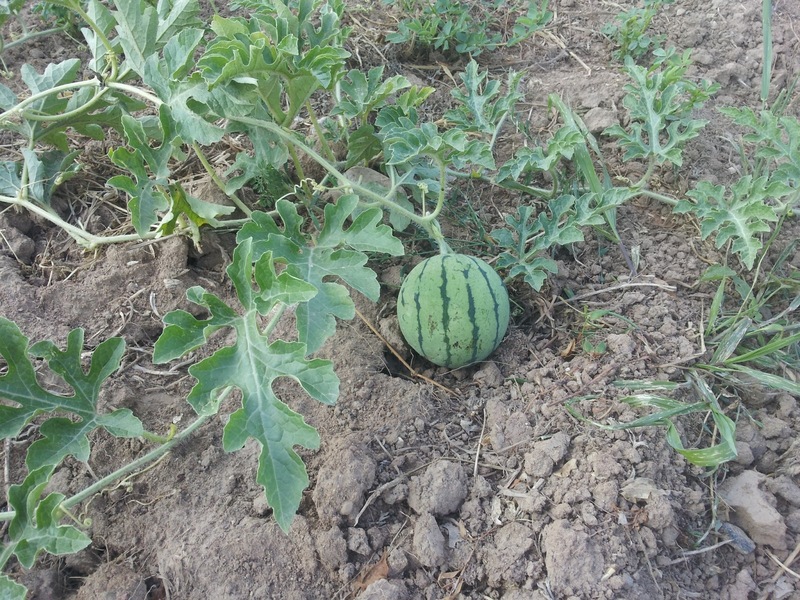 We've heard great things about this variety and are excited to try it! Velvet Red Cherry Tomato - There's nothing better than eating a cherry tomato right off the vine, still warm with the sun's heat. This variety has a silvery gray dusty foliage and produces an excellent, sweet cherry tomato. Can't wait! Wapsipinicon Peach- Originated with Elbert S. Carman in 1890 under the name White Peach. This strain came from Dennis Schlicht and is named after the Wapsipinicon River in northeast Iowa. 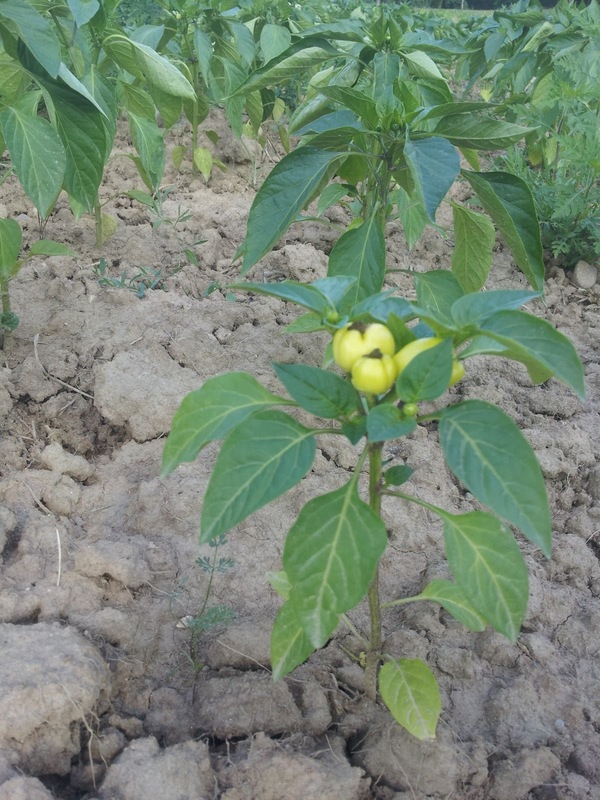 It produces 2" round fuzzy yellow fruits with a sweet, juicy and well-balanced flavor. Rutgers Tomato-The legendary Jersey tomato, introduced in 1934, is a cross between J.T.D. (an old New Jersey variety from the Campbell Soup Co.) and Marglobe. Its flavor, both for slicing and cooking, is still unequaled. Sheboygan- Grown since the early 1900s by Lithuanian immigrants in Sheboygan, Wisconsin. Pink paste type 4-6 ounce fruits. Excellent flavor, great for canning, sauce, and paste! Roma- Meaty interiors and few seeds. Great for canning, sauce, and paste! We find the roma-type tomatoes to be the best for our favorite tomato-dish, Bruschetta, salsa, and guacamole. Yellow Pear- This old variety bears yellow, bite-sized fruit. The flavor is deliciously tangy. Oh my goodness it's been hot! Fittingly we have the first of the summer crops for our shares. 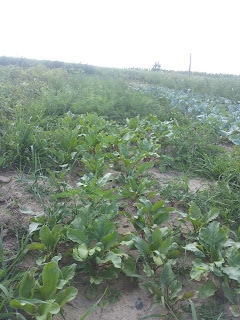 We also are seeing the last of the salad mixes for a while, it has officially crossed the too hot for cold season crops point. The summer squash is one of our favorite vegetables and likely many of yours. You will be seeing a mix of the varieties we are growing which include your classic Zucchini, Yellow Crookneck squash, or a more interesting Scallop Squash (it looks a bit like a flying saucer). There are lots of great ways to eat these squash, anything from sautéing, grilling, or you can try our recently posted Spaghetti Carbonera with Bacon and Summer Squash. This will likely be the last of the salad mixes for some time. The heat has baked most our young lettuce, and the older lettuces are starting to bolt. Bolting occurs in most plants when the conditions are unfavorable for its growth, so it focuses more on reproducing through seed. We are cutting up the best of the rest, and then we filled the bag out with arugula. Enjoy! 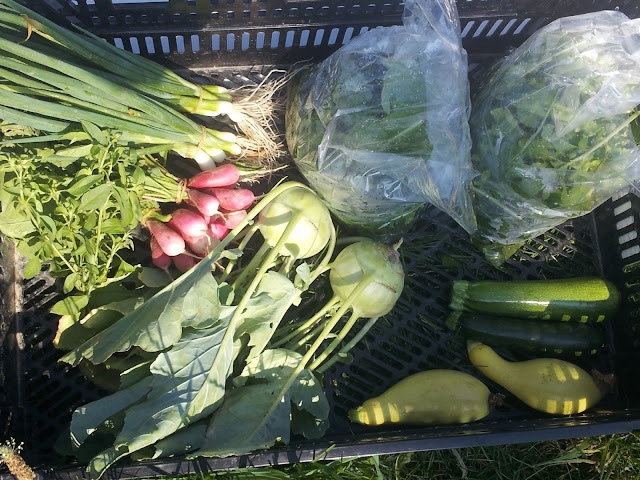 We have a last batch of radishes until the fall growing tucked under some tomatoes to give them some shade. As a result we have a bunch of French Breakfast radishes for you. Don't forget to make use of the greens as well as the roots. One of the easiest sides to make to a meal is sautéed radish greens in butter and garlic. We've got more and larger bunches or Lemon Basil this week. Lemon Basil is a basil variety from northeastern Africa and southern Asia. It goes really well with seafood dishes, but also with pasta and chicken dishes. Finely chop this basil and add it to some shredded or julienne vegetables and pasta, topping it with olive oil for a fresh and healthy meal. 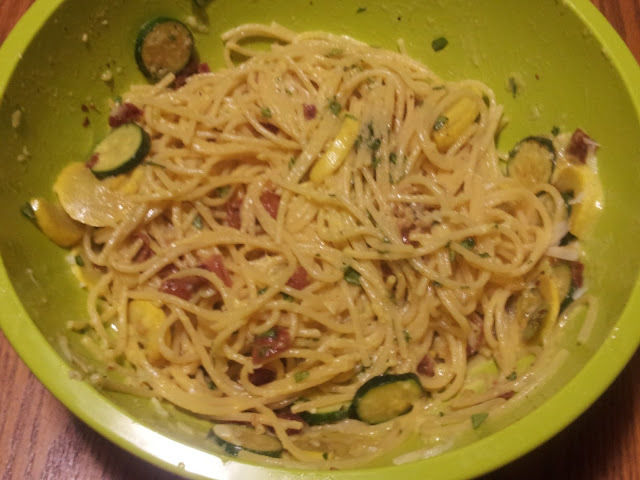 We added it to our Spaghetti Carbonera with Summer Squash recipe to give it some lemony freshness, yum! We've been enjoying some early summer squash here on the farm, both zuchhinni and yellow crooknecks, and they should be making an appearance in shares soon. We are just waiting for enough to produce to provide enough for all of the shares. This dish is easy and all can be sautéed one pan, one after another. The result is a delicious, much more filling and nutritious pasta dish. We like to do sautéed Kale with minced garlic and red pepper flakes as a side, made in the same pan as everything else for the dish. 1. Begin boiling water for spaghetti with salt and olive oil in the water. 2. Begin cooking bacon in a sauté pan. 3. Slice all your squash into bite size pieces, and mince your garlic. 4. Add spaghetti to boiling water. 5. Once bacon has finished remove from pan to a bowl with paper towels to drain and cool. 6. We then sautée the garlic right in the bacon grease (feel free to substitue butter or olive oil) for about 30 seconds and then add the Squash, which will take 5-7 mins sometimes a little more or less depending on heat of pan and type of pan used. Sautee until tender. 7. Mix 2 eggs with cheese and salt and pepper in a bowl large enough to hold all the ingredients and set aside. 8. Drain Spaghetti and immediately add to the bowl of eggs and cheese while the pasta is still very hot, this will instantly cook the egg and melt the cheese. Mix very throughly so that egg and cheese is evenly distributed. 9. Add bacon, garlic and squash, as well as any fresh or dried herbs you like. Mix together. 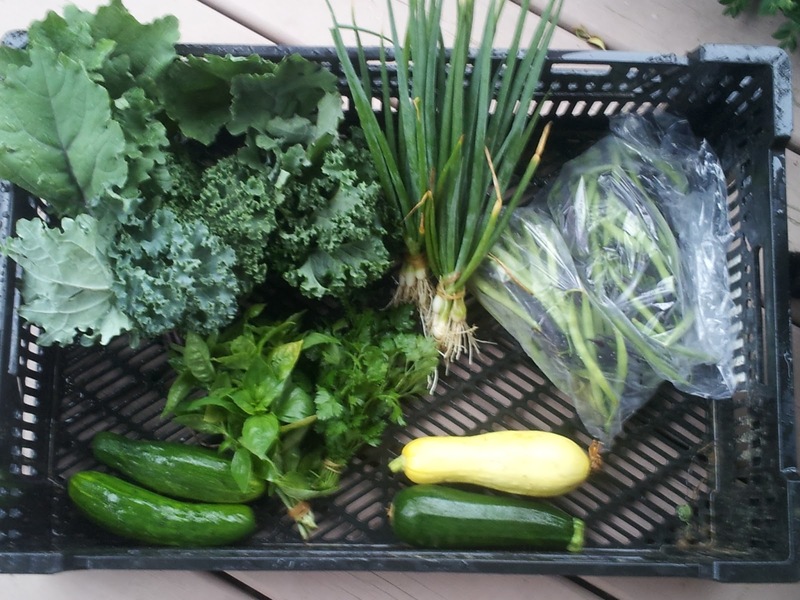 This week for our CSA we have a cut salad mix with spinach, arugula, a parisian red lettuce and green oakleaf lettuce, we also have a bunch of kale, green onions, genovese basil, lemon basil, onion chives, parsley and cilantro! 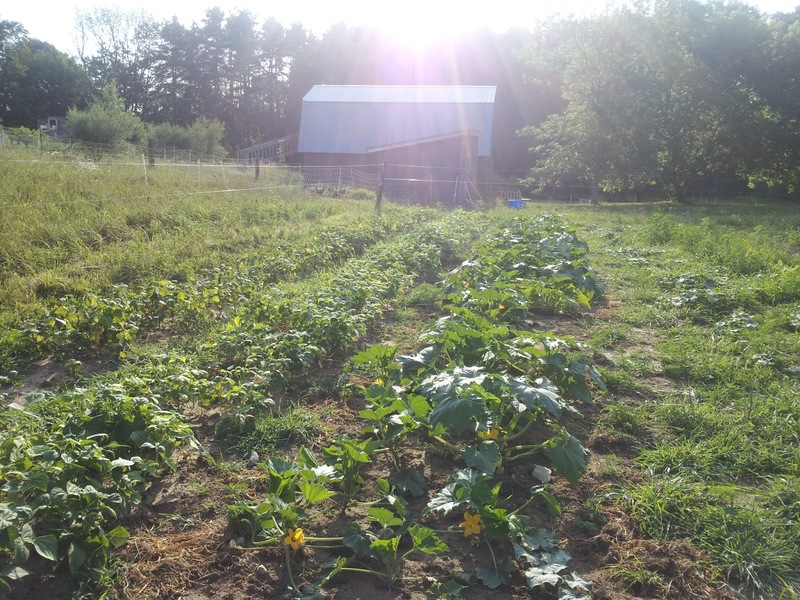 As we are moving into the heat of summer the garden too is in transition--the cold season crops are waning in the heat and the we're waiting for the early summer crops--green beans, kohlrabi, cucumbers, squash--to begin production. So we have an herb-heavy share with the first of our green onions this week, while we wait for the first summer harvest! If you are having trouble getting through your herbs remember you can dry them and use them all year! Here's a simple How-To on drying your own herbs. 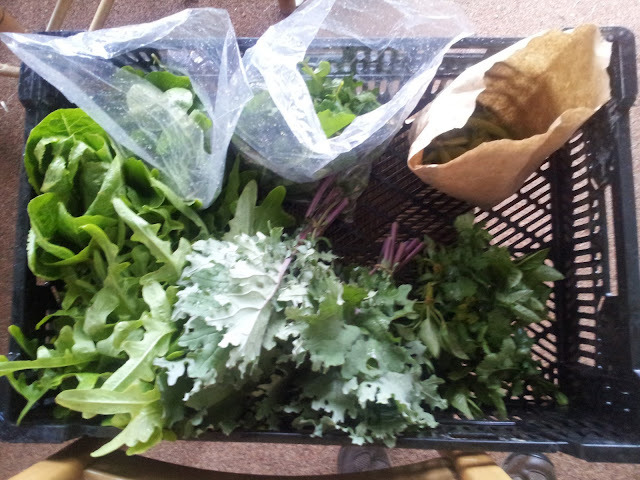 This week we have a mix of spicy arugula, spinach, a parisian red lettuce and a green oakleaf lettuce. Enjoy this taste of the freshness of spring, we may not be seeing arugula for awhile and our next planting of lettuce is still a ways off! We've got the first of our green onions this week! With a milder taste than onion, you can use both the small bulbs and the green stem. We love to use green onions on salad, in soups, as a pizza topping, in salsa, or in stir-frys. Try some mexican and mediterranean food this week with Cilantro! Add it to homemade guacamole, salsa, green chile, or white rice you can even throw it into a salad. We're big fans of the restaurant Chipotle, and have replicated their fabulous white rice in our own burritos. Give it a try! We've got more and larger bunches or Lemon Basil this week. 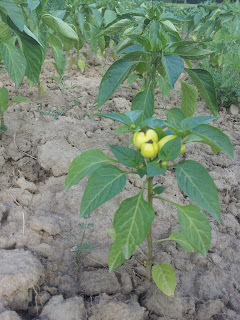 Lemon Basil is a basil variety from northeastern Africa and southern Asia. It goes really well with seafood dishes, but also with pasta and chicken dishes. Finely chop this basil and add it to some shredded or julienne vegetables and pasta, topping it with olive oil for a fresh and healthy meal. Also new this week is Onion Chives! Onion Chives have a milder flavor than bulb onions, as are most used with potatoes, fish, and in soups. We also really like them with eggs--in Quiche, a frittata, omelet or just diced and added on top of some scrambled eggs. One recipe I found and am dying to try is Chive Pancakes with Gorgonzola and Bacon. YUM! Want to make your herbs last longer? We recommend putting your lettuce heads, Kale, and herbs in a few inches of water in a cup or pitcher. You want enough water for the roots or stems to be submerged, but not any leaves. Treat them like cut flowers and they will last longer in your fridge; lettuce, after all, is primarily composed of water. 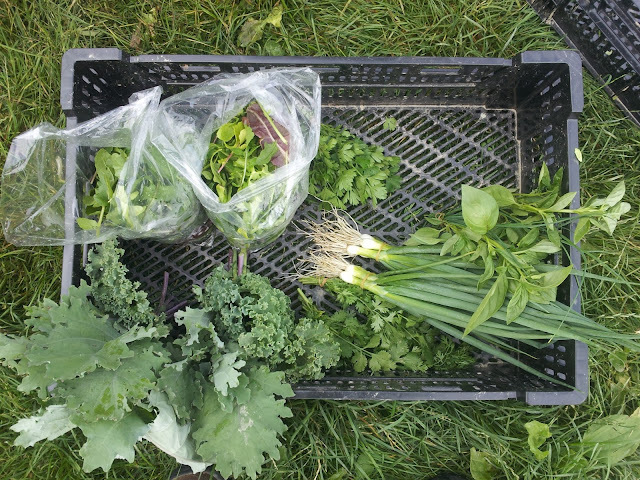 This week for your share we have a Arugula and Spinach salad mix, lettuce heads, some more peas, kale, and some new herbs: Lemon Basil, Genovese Basil, and Cilantro! We have a variety of lettuce heads for you this week. 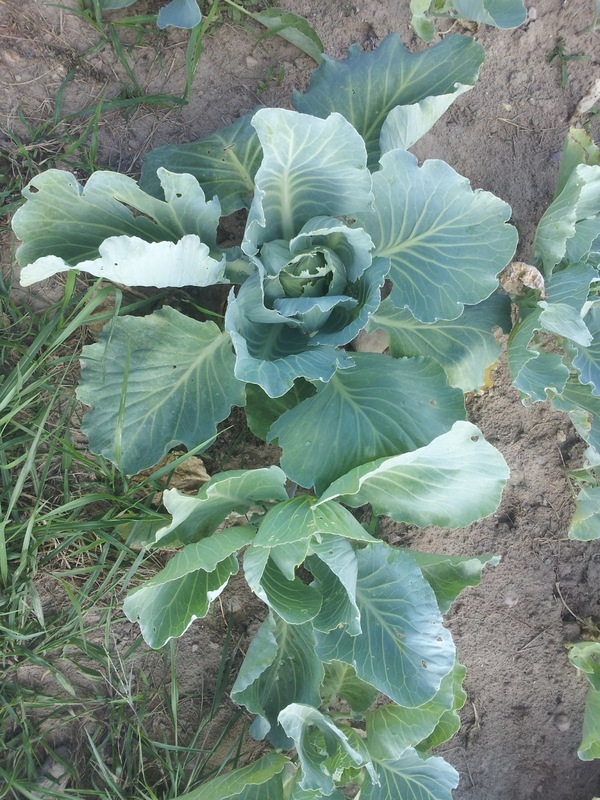 You may have any one of a few varieties including, a Parisian Red lettuce, Oakleaf Lettuce, Romaine, Black Seeded Simpson or Iceberg. Make a salad, it doesn't get any easier and will be a great starting point to use the rest of the share! Want to make your greens last longer? We recommend putting your lettuce heads, Kale, and herbs in a few inches of water in a cup or pitcher. Treat them like cut flowers and they will last longer in your fridge; lettuce, after all, is primarily composed of water. And like cut flowers, try to keep any leaves out of the water, to keep it fresher longer! 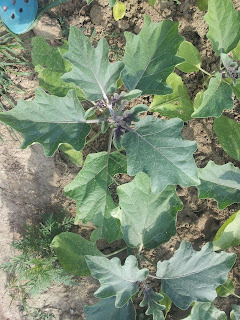 This week we have a bunch of the Siberian Kale (with the purple veins). Juice them, saute them, braise them, or make them in to chips! They also are a great addition to a vegetable soup. 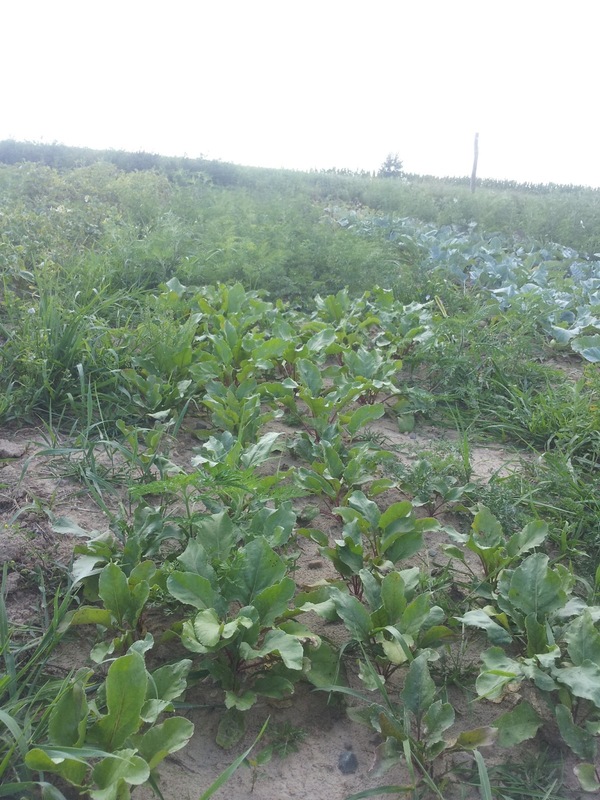 This week we have more Arugula and Spinach for you! Add these to your lettuce heads or make them a meal in themselves. Want to splurge on a delicious salad? Add pine nuts and crumbled goat cheese with sunflower oil as your dressing, you won't regret it! This last week we were making sandwiches with the mix. We had some great bread from the farmer's market, smeared some goat cheese on the bread and stuffed it with greens and it was excellent! More Sugar Snap peas this week, we've decided that we definitely need more peas in our lives, so we'll be growing a larger fall crop of peas. Eat them raw, on a salad, or you could try cooking them with this week's basil share. We're seeing the first of our heat-loving herbs coming in, and cilantro is one of our favorite. Add it to salsa, guacamole, or we like to make white rice with cilantro and lime juice. 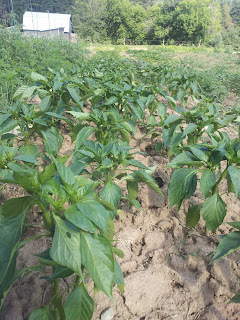 Lemon Basil is a basil variety from northeastern Africa and southern Asia. It goes really well with seafood dishes, but also with pasta and chicken dishes. Finely chop this basil and add it to some shredded or julienne vegetables and pasta, topping it with olive oil for a fresh and healthy meal. Genovese Basil is our favorite of the Italian Basil varieties, with large leaves and an amazing flavor. Our favorite Basil dish is Bruschetta, a kind of Italian salsa on slices of bread. Another easy way to use this herb and enjoy the early tomatoes of the season is with a Caprese Salad. Just a slice of Mozzarella, Tomato, and a basil leaf with a balsamic vinaigrette drizzled on it. Mmm, can't wait for our own tomatoes! Check out this Spice Chart, to see what dishes these herbs go well with! If you are having a hard time using your herbs, you can always hand them in a dry, well ventilated area and dry them to replenish your spice stores!